An earlier post discusses the pass rate gap between Economically Disadvantaged students and their more affluent peers and how the revised SOL tests have increased that gap. While the draft of that post was marinating overnight on the hard drive, my old, slow brain finally connected the dots: The real problem with those tests was not pass rates; it was accreditation. The lower pass rates under the new, tougher tests were spawning a plethora of schools that were denied accreditation. 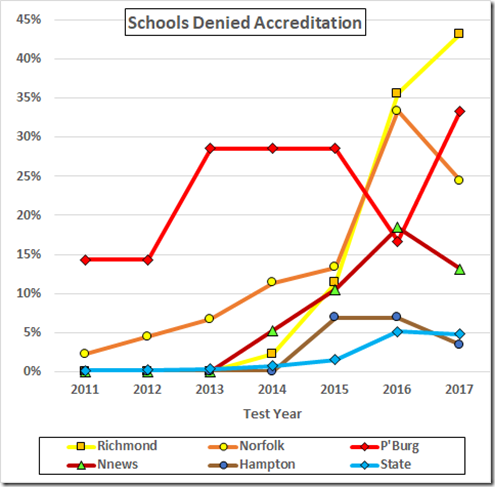 The three-year rolling average “adjustment” to the accreditation scores delayed the effect of the revised tests, but by 2016 one school in twenty was “denied” and some older cities were accreditation disaster areas. The Board of “Education” was failing in its prime mission: Looking good in the glow of schools that were doing well. The Board has demonstrated, and Board members have admitted (Sept. 21, 2016 video starting at 1:48), that they don’t know how to fix those awful schools. To solve this problem, then, the Board chose to (further) corrupt the accreditation process. 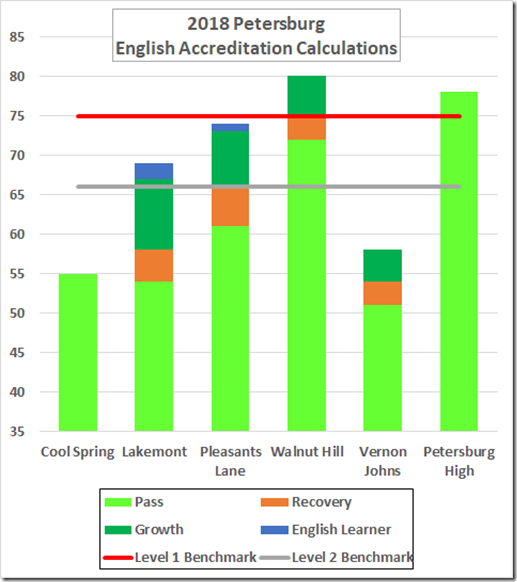 English learners who show “progress” count as passes. For an example, in Petersburg this year the English adjustments added fifteen points at Lakemont and twelve at Pleasants Lane. But, as the Petersburg data show, even that is not enough for some schools. So, under the new regulation, even a school that fails miserably after all the adjustments cannot be denied accreditation unless it “fails to adopt and implement . . . corrective action plans with fidelity.” And, even then, the school only “may” be denied accreditation. Translated from the bureaucratese: A school will be accredited, no matter how terribly it performs, so long as it does not tell the Board of “Education” to go eat one off a twig. Problem solved! No matter the SOL numbers, every principal (except at Carver, where they got caught cheating) can now say: “Our school is accredited.” And the Board can claim credit for that educational triumph.